In her everyday life, Kuroyukihime is the epitome of a model student – smart, well-behaved and popular with her schoolmates. With her beauty and aura of authority, she is more often seen as an object of admiration than an ordinary girl. 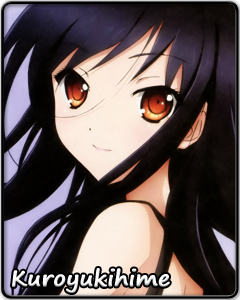 But little do those around her imagine that the true Kuroyukihime is somebody greater yet than she appears. In a world hidden from their eyes, Kuroyukihime bears the title of “king”, leading the legion of her followers to battle and glory. Kuroyukihime's journey to the top was a long and difficult one. She gained strength, but suffered wounds which would haunt her forever. She met people who would become her most trusted companions, but learned the bitter taste of partings and betrayal. She thought herself ready for the hardship and sacrifice awaiting her, but even she could not predict the despair to come at the end of her path. As her past catches up to her, Kuroyukihime has no choice but to face the aftermath of her choices. She must decide either to give up on everything she had built up so far… or take on the responsibility of a king once more. As Kuroyukihime seeks out help in her quest, she will find out that not only are the bonds from her past not completely gone, but also that there are new feelings she has yet to discover. To persevere against the weight of her sin, Kuroyukihime must do something she has never done before: find the strength to trust another and firmly grasp their hand.